Tessie almost never stayed in shelters; she camped out. It seemed she knew everybody on the streets, calling them “uncle, sister.” It was impossible not to love Tessie or be moved by her concern for other people despite the tribulations of her own life. Leaf of Remembrance for Tessie Comeslast, being cleaned May 2013. She used to drink, and like many drinkers I’ve known had a profound understanding of pain. We used to talk about that, sometimes. Once when I was going through a hard time, we talked about illness. She seemed tired, and told me she’d just been diagnosed with the same form of cancer as a friend of mine who was dying. Tessie matter-of-factly told me she’d decided not to seek treatment, that she didn’t have faith in the curative power of Western medicine. We cried for each other, sitting together at the dinnertable, as chaos swirled around us. Tessie was poetry in that moment. She wasn’t ever involved with homeless organizing efforts, and used to joke with me about how I’d have a heart attack if she ever showed up at a meeting. I think we both knew she wouldn’t ever come but that it would be an incredible celebration when she arrived. Tessie seemed to know better than most of us the fleeting nature of power and the inevitability of pain and suffering. Her strength and grace lay in her faith that things will go well in the world, and in knowing we don’t own our own power but have to do the best we can when it arrives. She’s buried in St Ignatius, and her headstone, pictured below, shows the Seattle skyline. Tessie always had her feet in two worlds. 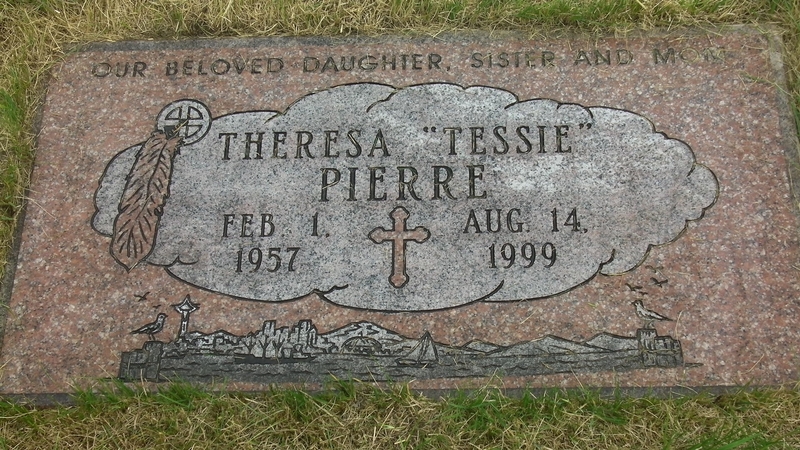 Tessie’s grave, in Montana. She had a foot in two worlds: her home reservation, and Seattle. The Seattle skyline is pictured at the bottom of her headstone. 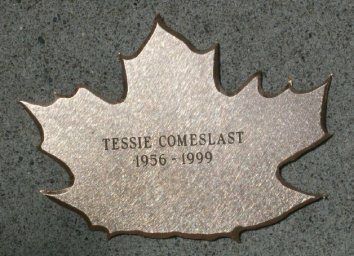 Tessie Comeslast’s leaf is placed at Angelines.